Bishop Napoleone Comitoli invited the Oratarian Fathers to Perugia in 1614. They settled for a short time in the Case della Parrocchia of the recently-suppressed parish of San Bartolomeo (later the Chiesa della SS Annunziata). However, Bishop Comitoli soon gave them a large piece of land here bounded by Via dei Priori, Via della Stella, Via Antonio Fratti and Via Ritorta. They initially used an early Christian baptistery on this site that was known as San Giovanni Rotunda, which they later demolished. In 1624, they also acquired the nearby parish church of San Gregorio. They then began the construction of the present church, which is formally known as the Chiesa dell' Immacolata Concezione e di San Filippo Neri and which is also known as Chiesa Nuova. Its design by Paolo Maruscelli is based on that of the Oratorians' mother house, Chiesa Nuova (also called Santa Maria in Vallicella), Rome. The first Mass was celebrated in the church in 1635 and work on the cupola began in 1640. Construction was interrupted first by the War of Castro (1643) and then by serious subsidence, and was completed only in 1648. Bishop Marcantonio Oddi financed the construction of the facade in 1662-5. (He had wanted to finance the facade of the Duomo but had been rebuffed by the Canons). 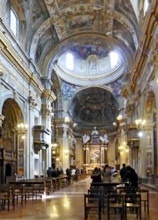 The Oratorian Fathers built the nearby Oratorio di Santa Cecilia in 1687-90 on land that they acquired from Andrea Sciri. It was purpose-built for musical devotion, to a design by Pietro Baglioni, and dedicated it to St Cecilia, the patron saint of music. The Oratorians commissioned an altarpiece (1688) of the Madonna and Child with SS Cecilia and Philip Neri from Carlo Lamparelli for the altar wall of the oratory. ✴The small square outside its entrance was cleared in 1736. ✴The steps (1665) leading to the main entrance, which had unfortunately been built over a well, had to be rebuilt in 1772 (and again in the early 20th century). ✴The original campanile was inaugurated in 1779. (It was demolished in 1930, when the present, higher campanile was built). The parishes of San Giovanni Rotunda and San Gregorio were formally united with that of San Filippo Neri in 1772, and their churches were subsequently demolished. San Filippo Neri itself fell into a poor state in the late 20th century, and has recently been restored. The interior has a barrel vaulted single nave and lateral chapels, a fine cupola over the crossing and a semi-circular apse. It is richly decorated with frescoes from the 17th and 18th centuries. Cardinal Luigi Capponi, Archbishop of Ravenna commissioned this altarpiece from Pietro da Cortona for the high altar. 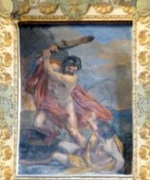 Progress was delayed because of the artist’s poor health, and the work was finished by his Ciro Ferri, Pietro’s “scolaro famoso” (famous student). The altarpiece has unusual iconography, in which God creates the Virgin using the gesture that Michelangelo used in his famous fresco (1509-12) of the creation of Adam in the ceiling of the Sistine Chapel. The Virgin stands on a cloud above a vanquished dragon that represents original sin. This altarpiece has been recently restored. 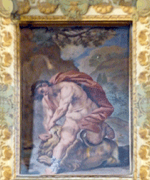 These damaged frescoes by Giovanni Andrea Carlone are set in a decorative frame by Nicolò Giuli. They depict scenes that relate to the theology of the Immaculate Conception of the Virgin. For example, the scene directly above the curved altar wall depicts Esther pleading with the Persian King Ahasuerus for the lives of the Jews in his empire: theologians regard Esther as a prefiguration of the Immaculate Virgin. According to the guide to Perugia written by Serafino Siepi in 1822, these panels in the apse were commissioned from Pietro Montanini to mark the 50th anniversary of the unification of the parishes of San Giovanni Rotunda and San Gregorio with that of San Filippo Neri. 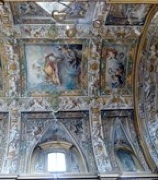 This fresco in the cupola by Francesco Mancini depicts the figures of the Trinity crowning the Virgin. 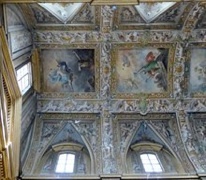 These four frescoes by Giovanni Andrea Carlone in the pendentives of the cupola include this image of St Luke, in which an angel above to the right holds the panel of the Madonna and Child that he was reputed to have painted. ✴woman clothed with the sun, with the moon beneath her feet. This chapel is in the left transept. This chapel is in the right transept. A relic of the heart of St Philip Neri is preserved on the altar. ✴Jeremiah contemplating a phoenix, which prefigures the resurrection of Christ. The altarpiece in this chapel is a copy of that by Guido Reni, which was painted in 1614 for the Chiesa Nuova, Rome (and is now replaced there by this copy in mosaic). The dedications of the chapels constitute a coherent Marian programme, proceeding anti-clockwise from the 3rd chapel on the left. This is the 3rd chapel on the left. Its original altarpiece (1643) of the Birth of the Virgin by Pietro da Cortona is described below (see Art from the Church). This altarpiece, which is attributed to Simeone Ciburri, is on the altar of the Cappella della Natività (the 3rd on the left). However, it almost certainly originally came from a Franciscan church. It depicts the stigmatisation of St Francis, with the Virgin above, flanked by: SS John the Baptist and Anne, to the left; and SS Catherine of Alexandria and Gregory, to the right. •the conversion of St Paul. This chapel (also known as Cappella Biggazini) is the 2nd chapel on the left. Its original altarpiece (ca. 1665) of the Presentation of the Virgin by Luigi Pellegrino Scaramuccia is described below (see Art from the Church). •David entrusts the Ark of the Covenant to Obed-Edom. This is the 1st chapel on the left. This altarpiece is by Francesco Trevisani. This is the 1st chapel on the right. This altarpiece is attributed to Giuseppe Passeri. This is the 2nd chapel on the right. Its original altarpiece (1651) of the Purification of the Virgin by Andrea Sacchi is described below (see Art from the Church). •St Simeon gives thanks after the service. This is the 3rd chapel on the right. Its original altarpiece (1637) of the Assumption of the Virgin by Guido Reni is described below (see Art from the Church). The present altarpiece is attributed to Giovanni Francesco Romanelli. •the Apostles around her empty grave . The sacristy is to the left of the apse. This altarpiece in the sacristy, which depicts the Virgin with SS Michael and Mary Magdalene, is attributed to Vincenzo Pellegrini. The original altarpieces (17th century) on the side altars formed a Marian cycle and were commissioned from some of the finest artists working in Rome. Unfortunately, they were later removed, and many have been lost. Cardinal Luigi Capponi, Archbishop of Ravenna commissioned this altarpiece from Guido Reni for the altar in the Cappella dell' Assunzione. Napoleon's commissioner, Jacques-Pierre Tinet selected it for confiscation in 1797, at which point it was in a poor state of repair. It was probably for that reason that it was sent from Paris to Lyon in 1801. It is now in the Musée des Beaux Arts, Lyon. A copy (18th century) of this altarpiece by Anton Maria Garbi, which was originally in San Filippo Neri, Montefalco, is now in the Pinacoteca there. Sofonisba Petrini commissioned this altarpiece, which is signed and dated, from Pietro da Cortona for his family chapel, the Cappella della Natività di Maria. The Oratorian Fathers were upset by the voluptuous representation of the female figures, but they were over-ruled. The altarpiece is now in the Galleria Nazionale. This altarpiece by Andrea Sacchi, which depicts the presentation of the baby Jesus at the temple during the ritual purification of the Virgin after His birth, came from the Cappella della Purificazione di Maria. It is now in the Galleria Nazionale. Count Giovanni Antonio Bigazzini commissioned this altarpiece from Luigi Pellegrino Scaramuccia using money left for the purpose by his mother, Artemizia. It was installed in the Cappella della Presentazione di Maria, which belonged to the Bigazzini family. It is now in the Galleria Nazionale.